In a lab+lectures program and field trips we examine the urban visions reflected in Singapore’s urban media aesthetic environments and ask: how can we identify different urban visions in urban art and aesthetics, and how can they co-exist? How do these visions translate into experience at street level, and how do they affect human behavior? The Academy program will combine learning on urban media art histories, urban theory, curatorial inquiries and criticality as well as ‘knowledge from the field’ via conversations with professionals. It will introduce participants to methods of artistic research, concept development and artwork proposals for creative city making. Shannon Mattern. ”Preface,” in Deep Mapping the Media City. Minneapolis: University of Minnesota Press, 2o15. Nikos Papastergiadis, Amelia Barikin, Scott McQuire and Yue Audrey, “Introduction: Screen Cultures and Public Spaces,” in Ambient Screens and Transnational Public Spaces, ed. Nikos Papastergiadis. Hong Kong: Hong Kong University Press, 2016. Henriette Steiner and Kristin Veel, “Smart Complexity?” in What Urban Media Art Can Do: Why When Where & How. Stuttgart: av edition, 2016. Mark Shepard, “Predictive Geographies,” in What Urban Media Art Can Do: Why When Where & How. Stuttgart: av edition, 2016. Scott McQuire, “Performing Public Space,” in The Media City: Media, Architecture and Urban Space. London: SAGE Publications, 2018. Krzysztof Wodiczko, “Critical Vehicles,” Massachusettes Institute of Technology, 1999. Erkki Huhtamo, “The Four Practices? Challenges for an Archaeology of the Screen,” in Screens, eds. Dominique Chateau and José Moure. Amsterdam: Amsterdam University Press, 2016. Project: ELMAN, a creative art exchange between two distant urban media displays – the Elbphilharmonie Media Wall (Elphi) in Hamburg and the Media Art Nexus (MAN) at the Nanyang Technological University Singapore (NTU). Project: on|off 100101010: Colliding and Surrendering: chaos and freedom where art and technologies meet An International Symposium & Exhibition 2017. Fourteen international research institutions, media labs, and cultural enterprises will be using Media Art Nexus NTU as a platform to display new media art created by interdisciplinary teams. The Emote Project is ongoing research which tries to establish a more tangible triad between art, learning, and science with the aim to investigate if music/visual art could facilitate learning in an abstract/ambiguous situation. A permanent exhibition of experimental animation on display daily at the Media Art Nexus consists of a series of six experimental pieces made with audio reactive real-time animation software. Guy Debord, Society of the Spectacle, New York: Zone Books, 1995 . Luke Hespanhol, “Making Meaningful Spaces: Strategies for Designing Enduring Digital Placemaking Initiatives”, paper for The 1st International Conference on Design, Innovation, and Creativity (22-23 February 2018) Bangkok, Thailand. LOL is an interactive installation that invites you to simply laugh out loud in public, together with everyone else, in a loop of contagious collective joy. Solstice LAMP consisted of an interactive light and sound installation transforming the AMP Building at Sydney Cove into a giant urban musical instrument. The installation built on the notion of transformation: from amorphous existence into life, from silence into melody, from crisis into creativity, from the forecourt of a large financial corporation into a lively stage for collective play. Part of the Footbridge Gallery at the University of Sydney campus, an ongoing digital placemaking project I am the Curator and Lead Designer of. Participatory digital storytelling developed with refugees from Iraq currently living in Liverpool, Sydney. Australia, and exhibited at the urbans screen at the local pedestrian mall. 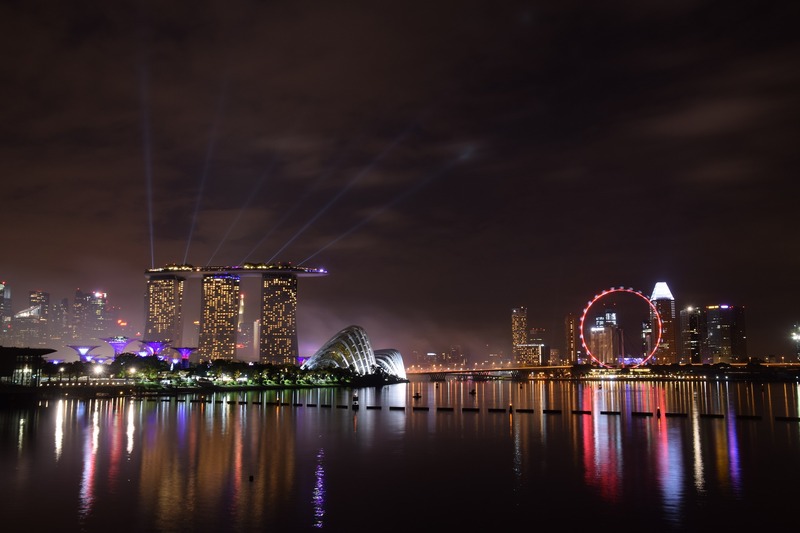 After the program all participants will submit a text (max 600-800 words) in English, which will present your analysis and perspective on Singapore as a context for urban media art. Your answer to the question posed in the call for this academy: What can urban media art do for Singapore? was an initial exercise for this text, and you may want to build on your reflections submitted here. Conclude: what could urban media art do for Singapore – as a city of quantifies visions? Why, when, where, and how? After feedback and evaluation (pass/no pass) based on the above guidelines and demonstration of the acquired learning goals, your texts will be edited and combined in an Academy report on Singapore summing up our investigations and findings during this program. The program is open to students, artists, designers, architects, creatives, city-makers, architects and others with interest in urban media art and what it can do for the city of Singapore. Registered participants will receive a certificate upon completion. Registration is open until January 31, 2019, or until full (20 participants). 100-word short statement: What can urban media art do for Singapore? The Urban Media Art Academy is supported by the Goethe-Institut Singapore and co-hosted by the School of Art, Design and Media and the National Gallery Singapore and co-funded in the framework of Future DiverCities and the European Union, Creative Europe Program.